Greensboro residents, young and old joined together this week to honor the life and legacy of Rev. Dr. Martin Luther King Jr.
Celebrated on the third Monday of January, Martin Luther King Jr. Day has become a day of volunteer community service. 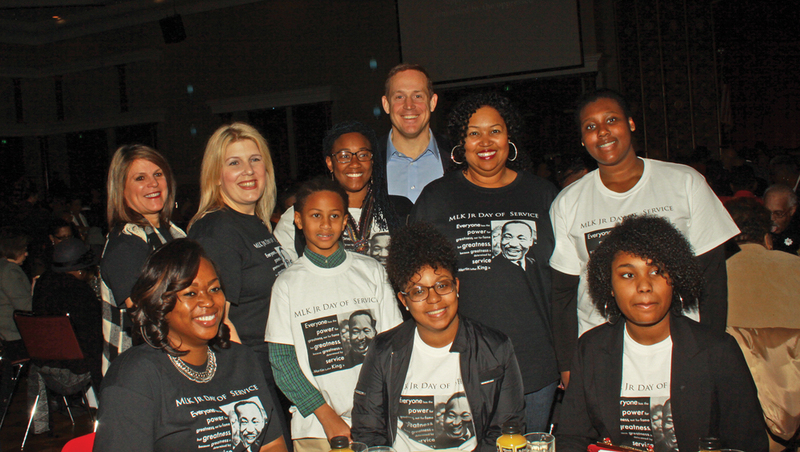 To kick off MLK Day, the City of Greensboro Human Relations Commission held its 30th Annual Memorial Breakfast honoring the legacy of Dr. King at the Koury Convention Center. The annual breakfast was complete with performances by father and son drummers, Wesley and Jeremiah Williams, The Gate City Youth Slam Team, and a keynote address delivered by pastor and author, Dr. Oscar Dowdell-Underwood, founder and president of Cornerstone Christian Bible College in Fort Wayne, Indiana. Dowdell-Underwood spent decades as an activist championing the scholastic achievement of Black men. He is also the author of Bumblebees Can Fly: Empowering Young Men of Color, and referenced his book to encourage breakfast participants to use their inherent potential. “It is a time for vigorous action, not a time to be complacent. In the urgency of now, it’s time to take our noses off the window,” said Dowdell-Underwood. He said it is Greensboro’s rich history steeped in the sit-ins of the Civil Rights Movement that makes him believe it is still possible to change things. “Greensboro, when I go back to Indiana, I will tell them that Greensboro still has hope,” he said, asserting that the people of the city and the N.C. A&T Four were chosen by God to lead the sit-in movement of the Civil Rights Movement. “Just like you were chosen then, you’re chosen now. The same anointing that was on those four young men is on this city today,” said Dowdell-Underwood. At Temple Emanuel’s annual Shabbat service on Friday, January 13, Greensboro Police Capt. Nathaniel “Trey” Davis III delivered the keynote address. Davis shared a similar sentiment about the urgency of present times. Temple Emanuel’s annual public service is designed not only to honor the memory of Dr. Martin Luther King, Jr. but also to reach out and facilitate dialogue with others across the city. Shabbat refers to the seventh day of the Jewish week and is the day of rest and abstention from work as commanded by God. Shabbat encompasses two commandments: to remember (zachor) and to observe (shamor). This year’s service marked the 22nd year of the interfaith event which featured inspirational music and moving words from both faith-based and community leaders. Capt. Davis currently serves as the commander of the Criminal Investigations Division, and facilitates the department’s Faith Leaders Council, which brings together a diverse group of inter-faith leaders throughout the city of Greensboro. He also served as the Executive Officer to Chief of Police Wayne Scott and helped spearhead the department’s new Office of Community Engagement, which held a series of public forums on race and police relations across the city in 2015. As a third generation police officer, Davis said he grew up believing that he could positively effect change in his community. His grandfather, Nathaniel Davis Sr., was the first Black police officer in Louisburg, N.C. in the 1950s; and his father, Nathaniel Davis Jr., was the first Black police officer at Butner Public Safety where he retired as an Administrative Chief. “I see the opposition and the giant we often face in race and when we try to bridge those relationships between the people and police department,” said Capt. Davis addressing the rising level of violence and increasing level of mistrust between law enforcement and the community. According to police department statistics, Greensboro saw a 10 percent increase in violent crime during 2016. Fatal police shootings tracked by The Washington Post from data collected from news reports, public records, social media and other sources shave determined that 963 people were killed by police in 2016. Dr. Love Crossling, director of the Greensboro Human Relations Department, said it is not so much about the performance of civil rights work, but the inner heart of the work that will begin to work towards change. “If we can embody the reality to do this job every day, then we will be pushing towards the goals of Dr. King. The charge is across the world but the challenge starts at home,” said Crossling.